The Seven Deadly Sins Vol. 7 Review – AiPT! An intense conclusion to the Vaizel Fighting Festival arc. 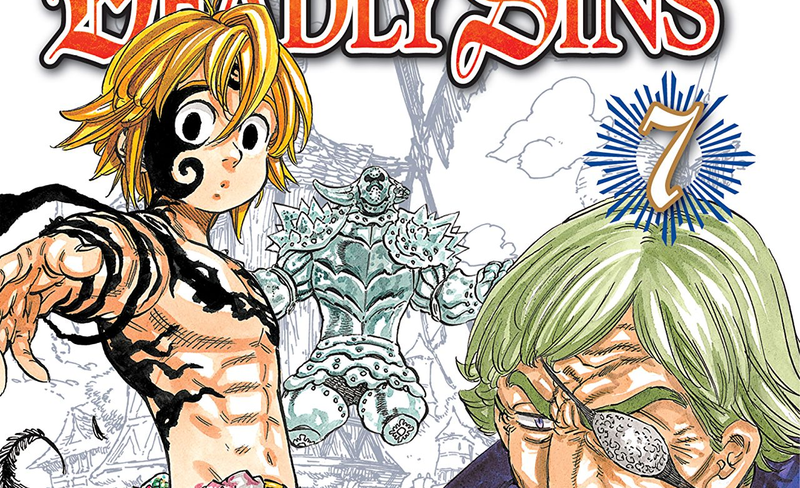 It’s time to get back to The Seven Deadly Sins after a long break and check in with the seventh volume, just as hell breaks loose and annihilates almost everything in sight. Is this installment good? The seventh volume brings about the finale to the Vaizel Fighting Festival arc and gets us back on track with finding the remaining Sins. Focusing on the festival first, it’s a strong, intense, and nightmarish conclusion. It foretells the coming threat of the returning demons and just how dangerous the Holy Knights have become, signalling that our cast will need to get stronger quickly. The heroes ultimately survive and walk away, but not without terrible prices being paid. This is easily one of the most dramatic moments of the series, especially with how it leaves everyone unsure of the future and what will be coming. It’s all really done well. The rest of the manga’s story focuses on hunting down and finding another Sin, the Goat Sin of Lust known as Gowther. In comparison to the other new Sin arcs besides Diane’s, this storyline moves very swiftly and wastes no time getting things moving. This short arc (which, admittedly, continues into the next volume) is much appreciated after the last one that went on for two full volumes. The only things that are a bit underwhelming are how the relationship between Gowther and the kid who saved him is very rushed, and there’s a twist that is sort of predictable. You just get a feeling that this particular character is going to end up being Gowther fairly quickly. The character work is almost equally as strong as the story. Meliodas, our lead, doesn’t necessary grow or change, but we see a new side to him, one that he isn’t able to control. This demon side is vicious and violent, almost slaughtering and destroying every being in its wake. The only exception is Elizabeth, who he backs off of for some reason. Elizabeth herself renews her vow to bring peace back to the land and move forward after suffering the loss of her sister. It’s a good reinforcement of her pledge, though you’d think she would be a bit more broken by her loss. This could, however, also be a sign of her growth, with her determination in her convictions giving her the strength to keep going forward. There are also good minor character bits with the other cast members. There’s Ban’s loyalty to Meliodas, showing how much he cares about and values him. He’s one of the very few people to ever treat him with respect or not shun him, which ties back into some of his smaller flashbacks we’ve seen. With Howzer, we build upon his good nature and care for people, wanting to rumble with Marmas for putting a civilian in grave danger and for his lack of care towards people in general. He even lets Diane go due to her caring attitude towards others, giving her a warning of future conflicts with the knights. He’s the first real Holy Knight, from start to finish, to show that he truly lives up to the title of knight even if he can be a bit boastful. Sir Helbram, meanwhile, continues to make a good impression as a villain. Besides his incredible power of Link, which lets him borrow powers from other knights, he’s very intelligent. He studies his opponents, even during battle, and is able to counter them fairly easily with his abilities. He’s not fazed by most things but he can be overconfident, gets careless when he thinks he is at big advantage, and is overzealous in his attacks. There’s no real backstory to him so far, but I’m very intrigued to see more of him in the future. Lastly, we have the mysterious Gowther, our newest character and one that’s be a bit spoiler-ridden given their late introduction. We don’t get much of a read on Gowther until the very end when he drops his act. Up until then he’s known as Armando, a person watching over the mayor’s kid who saved him years ago, and who’s very nervous and easily flustered. When he comes into himself, he’s a very effeminate man who speaks formally and as if he was a narrator for the series. Though he uses an armor to fight for him, he does seem powerful by himself when catching a Holy Knight’s magic-powered arrow. He’s fairly new, so we don’t know a lot about him yet, but he does make one heck of an impression. The artwork for the manga looks as good and unique as always, and is a bit scratchier and less clean than other series. The characters are well-drawn, never feel off-model, and are always great at capturing the mood of a scene through their expressions. I especially like Chapter 51 in that regard, which mostly consists of very reflective character work. The action looks incredible and really captures how absolutely brutal and harsh things get, especially in the Meliodas and Helbram fight. The layouts are put together well in that everything flows from panel to panel smoothly, even if the action is a tad static in some areas. Lastly, as per usual, I really enjoy the character designs in this series. The creator is so good at making distinct looks for everyone, and you just can’t help but soak all the detail in. Seven Deadly Sins Vol. 7 is an intense and action-packed conclusion to one of the first real big arcs of the series to date. While our heroes manage to make it out of danger, there are some unfortunate tragedies along the way. Things are looking tough going forward, even with a new ally on the horizon. If the level of quality and excitement brought forth by this arc continues forward, however, then this looks to be one enjoyable ride. An intense and action-packed conclusion to one of the first real big arcs of the series to date.